It has been so cold outside that I have been craving a creamy pasta dish like this one that screams comfort food! Creamy, white Alfredo sauce is loaded with saturated fat and cholesterol and it usually leaves me in a nasty food coma for hours after eating it. Traditional alfredo sauce has butter, milk, cream and cheese which typically leads me to that bloated feeling from the major dairy overload! Enter the amazing Cashew Alfredo Sauce that is dairy-free and oil-free. It is delicious, super creamy and very satisfying and easy to make. I promise! If you don't have a high-speed blender like a Vitamix, it is really important to pre-soak the cashews overnight so that they soften. I find the sauce ends up creamier and not gritty. However, a great cashew tip I’ve just started doing is boiling them for about 30 minutes before I use them instead of soaking them overnight. It works really well to soften them up and I can now make cashew alfredo on a whim instead of having to plan for it the night before. For the pasta, I use Go-Go brand Quinoa Pasta. Trust me on this one! Being Italian, I know pasta and this stuff has it all going on. 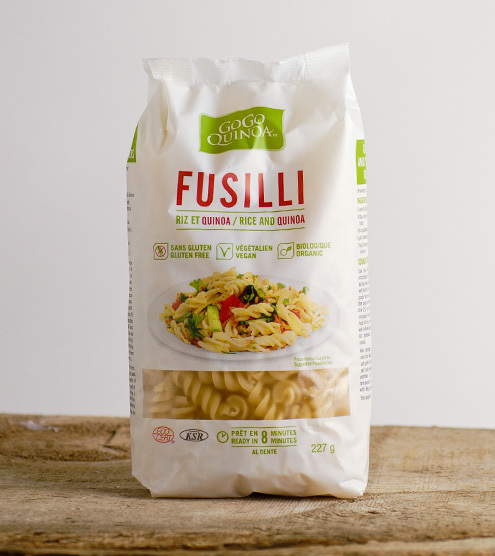 Made from organic quinoa flour, it's a gluten-free take on the classic noodle that is also wheat-free and vegan. The texture is basically the same as regular pasta so it tastes great! Not gluey in the least, and the flavour is nicer than neutral. The blast of extra protein from the quinoa is a nice bonus too. The nutritional yeast in this sauce not only gives it the cheesy flavor, but also boosts it with protein and B vitamins. I hope that you will try this recipe out for yourselves and share a big pot with friends and family. Remember...cooking is about having as much respect for the ingredients in a dish as for the people who gather to share it. When pasta is 3 minutes from being done, add the broccoli florets. Drain pasta and broccoli and add Alfredo sauce. Stir until combined and serve hot. To make the Cashew Alfredo Sauce, add all ingredients into a blender and blend for 1-2 minutes, until smooth and creamy.